I knew when I got the big idea to build one that if you have a wooden picket fence, you will need to spend a considerable amount of time each spring cleaning and repainting it. But still, I underestimated the time involved in accomplishing such a task. The weather has been the main obstacle. It’s spring #3 with my cute patio picket fence, and like spring 1 and 2, it’s been too stormy to get the job done all at once. So with paint bucket, wire brush, and wide wooden paint brush in hand, I run out in the mornings or early afternoon before the scheduled storms hit to tidy up as much as I can. A gallon of paint later, I still have 3/4 of a picket gate and a 4′ long section to go. As the thunder rolled in during my latest attempt, two hours earlier than predicted, and I realized that if I didn’t want my hard work washing away, down into the potato patch that I was painting near, I’d better seal my paint can and get indoors. I did just that. After dropping a quick rain shower on my little farm, the angry storm cloud that had threatened to wreak havoc moved on to the north and left my garden dry enough for me to do a little weeding. Very quickly, however, the next angry giant moved in and I barely had enough time to peek among the explosion of lettuce leaves in my mixed greens bed to see if there were any radishes that were ready to be pulled before fat raindrops started soaking me through my shirt. Startlingly cold at first, it took me a minute to realize that it was a clear, quiet rain that was doing a fine job of cooling me off from my earlier work, so I kept searching for radishes and inspecting my other crops while it showered. It’s always exciting to find full-grown veggies in the garden in the spring, rather than just the few green onions whose lives I’m willing to shorten by using them while they are young and tender. But the thunder finally did come crashing onto the scene and I ran, stopping just long enough to pick a sprig each of spearmint, lemon balm, and chamomile to make a single cup of tea. 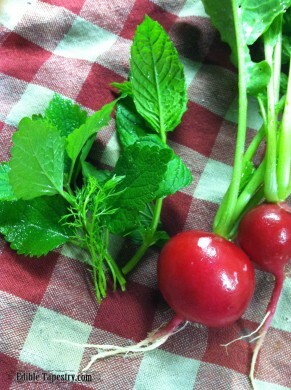 My herb tea leaves and the two fat radishes I found hiding beneath young lettuce and ruby red Swiss chard leaves. No tea strainer needed when I have full sprigs. I just pour boiling water right over them in my cup and let them steep for a few minutes. 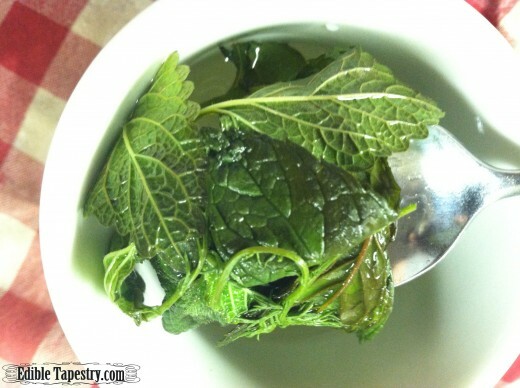 I’m assuming the specks in the bottom of my cup mean I didn’t wash my herbs well enough. Ew. I think the boiled water killed any critters I couldn’t see, but I will definitely be more thorough next time. 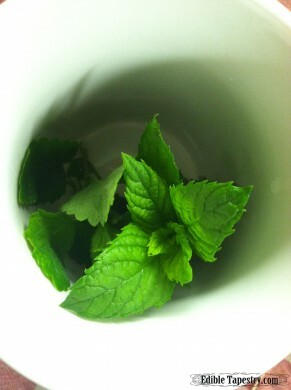 Lemon balm and chamomile are calming, perfect for a stormy day. 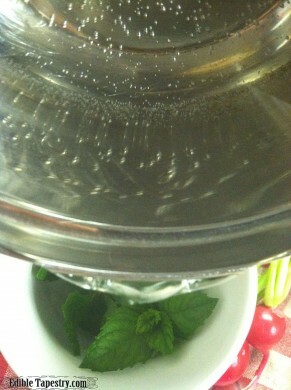 I included the mint just because it tastes so good and I have oodles of it growing everywhere I don’t want it to grow. 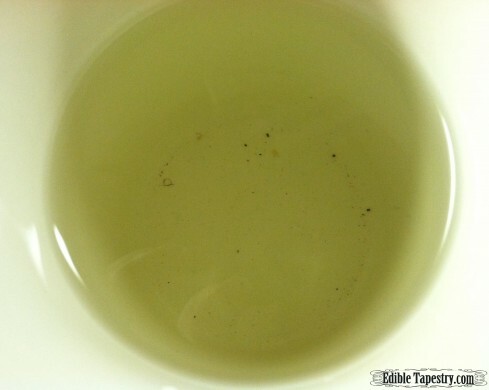 The sprinkle of turbinado sugar I added to the steeped liquid made it the perfect steaming cup of tea.